FOR IMMEDIATE RELEASE (Hollywood, CA), July 7, 2013— We cordially invite you to attend the FIRST Red Carpet Event of the Summer for the 2014 Artists In Music Awards: “The Breakthrough Series” at The Joint benefiting St. Jude Children’s Research Hospital! Price: $5 (recommended donation) at the door. 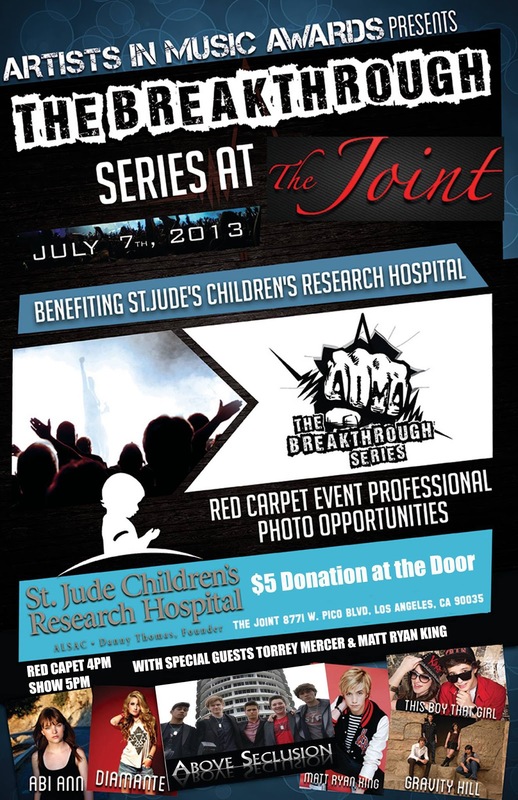 We will also accept higher donations at the door, which will benefit St. Jude Children's Research Hospital. Many celebrities, 2014 AIMA Nominees, and AIMA alumni will also be in attendance. St. Jude Children's Research Hospital was founded in 1962 and is a leading pediatric treatment and research facility focused on children's catastrophic diseases. The Artists In Music Awards is a privately held organization established for music artists and entertainers. Our mission is to entertain and give recognition to the finest emerging artists. Each artist we work with is not a product, but a valued partner. We are committed to providing an engaging and rewarding environment through live entertainment events including award shows, showcases, Red Carpet, and press events. For more information, visit our website at www.aimusicawards.com for the latest updates and artist profiles! Thank you to our sponsors Arts Seen & Heard PR, KGUP 106.5FM “The Emerge Radio Networks”, MusicSUBMIT, & 101Distribution, and a big thank you to St. Jude Children's Research Hospital.